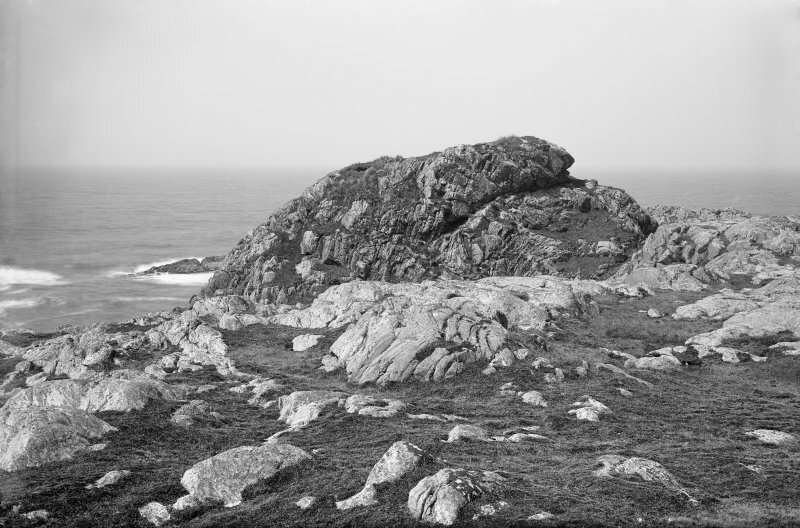 Dun Beic occupies a very strong site, and on its summit are the scanty remains of several small separate buildings, in the centre of the westmost of which were dug up numerous small round or oval stones about 1" long, such as are plentiful on many duns in Coll and Tiree. On the SW edge of the dun, on top of the cliff, were more of these pebbles, together with many fragments of hammer-stones and pottery - some of the latter well patterned. The boundary walls are now virtually non-existent, and only a further two pieces of flint were recovered from this site. A massive natural rampart, which has probably been artificially aided, stretches across the entrance, in the E.
Three fragments of pottery from here were donated to the National Museum of Antiquities of Scotland (NMAS) by Beveridge in 1907.. (Accession nos: HD 319-321). E Beveridge 1903; Information from NMAS accessions index. Dun Beic, the slight remains of a dun on the summit of a prominent rocky knoll. The wall has almost completely dis- appeared except in the E where a fragment of outer wall face, 2.5m long and 0.8m high, survives. Its course in the SW and W is defined by a slight grassy bank. The plan appears to have been roughly oval measuring about 20.0m NE to SW by 15.0m transversely. There are no traces of the buildings noted by Beveridge but there is a rect- angular hollow c.6.5m by c.3.0m, undoubtedly his excavat- ion. Below the knoll in the E is a natural gully in the rock but there is no evidence that it has been artificially strengthened, as suggested by Beveridge. There is no trace of an entrance to the dun but it has presumably been in the NE at the only point of approach. Many pottery fragments can be seen on the site, particul- arly on the W side where part of the base of a flat- bottomed pot of undecorated coarse gritty ware was picked up. Another fragment, decorated with horizontal grooves was also found. This pottery is typical of the coarse gritty ware found in sand-dune sites elsewhere on Coll. Visited by OS (R L) 26 June 1972. Dun, Dun Beic: This dun occupies the top of a small sea-girt stack some 18m high. Its wall was drawn round the margin of the summit, but only a few short stretches now survive; where best preserved, on the E, the rubble core and three courses of outer facing-stones are 0.7m high. Much of the interior is unsuitable for habitation on account of rock outcrops, and the greater part of the remainder is occupied by a secondary building now reduced to its foundations. This structure, the long axis of which lies NW and SE, measures 7.6m by 4.6m over walls averaging 0.6m in thickness and 0.3m in height; close to the centre of the NE wall there is an entrance which leads out into an irregular hollow between two outcrops. At the N end of the site a minor landslip shows that earth containing some burnt bone and sherds of plain and decorated pottery had accumulated to a depth of 0.6m before the construction of the rectangular building. Iron Age sherds and slag from here were donated to the NMAS by the RCAHMS in 1975-6 (Acc No: HD 2049). RCAHMS 1980,visited 1975; Proc Soc Antiq Scot 1978; J Close-Brooks 1980. NM 1544 5644 Surface finds of 24 sherds of pottery, including four decorated rim sherds, found inside Dun Beic.